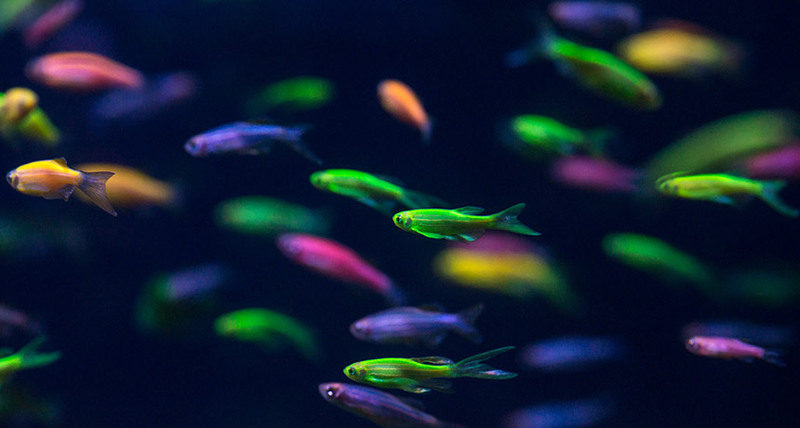 FISHY WORK In a poll of American's attitudes toward genetically tweaking animals, three out of four respondents said introducing genes to make aquarium fish like these glow was "taking technology too far." Scientists have the power to genetically engineer many types of animals. Most Americans think it's OK to alter or insert genes in animals and insects - provided it's done in the interest of human health, according to a poll released August 16 from the Pew Research Center. The findings are similar to those from an earlier Pew survey, which found that a majority of Americans are fine with tweaking a baby's genes, but only if it is to prevent disease. In the new survey, a majority of respondents support engineering animals for the benefit of human health. For instance, 70 percent approve of preventing the spread of disease by reducing mosquitoes' fertility (SN Online: 8/5/16), and 57 percent are on board with engineering animals to be organ donors for humans (SN: 11/2/17, p. 15). But people are not as comfortable with genetically manipulating animals for cosmetic or convenience reasons. A majority of respondents - 55 percent - object to genetically tweaking animal to produce more nutritious meat, saying that crosses a line. The results, based on a survey of 2,537 U.S. adults from April 23 to May 6, reveal the mixed feelings people have about this emerging biotechnology. Bringing species back from extinction didn't sit well with 67 percent of respondents, who balked at the idea of altering a living species to revive one no longer in existence (SN: 10/28/17, p. 28). Of that group,18 percent said species are extinct for a reason; 23 percent said it messes with nature or God's plan; and 14 percent said it's a waste of resources. Only 4 percent said they were afraid it would create a "Jurassic Park scenario," in which the de-extinct animals would run amok and kill people.